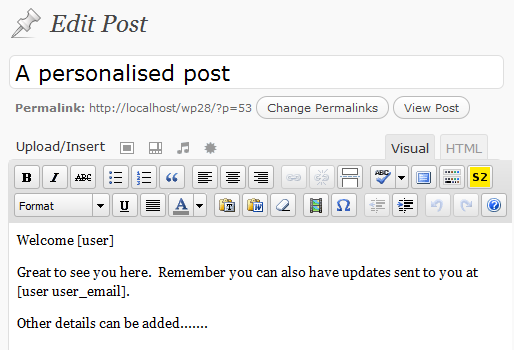 This free wordpress pesonalisation plugin allows one to use shortcode type functionality in any email template or page or post, to extract stored details of the viewer or reader and use them to personalise the content. 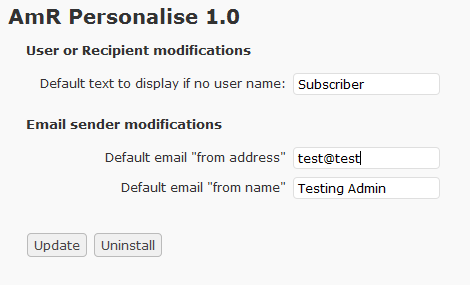 This plugin aims to support membership sites that wish to gather some member data and use that to personalise emails or posts and pages for a logged in user (and later on select their users by those criteria). It started as a requirement for a site that is using subscribe2, your members, and register plus. The web owner wanted to be able to use the first name (if gathered) when emailing customers. Personalising is not always easy, however it seems there is a demand! If emailing then the wp_mail filter is used to pick up the “to” recipient, (when emailing one person) and pickup their user details.